The head of the top U.S. environmental agency said on Wednesday that the Trump administration considers drinking water quality around the world a bigger crisis than climate change, despite the recent surge in debate around the proposed Green New Deal. In remarks in Washington to mark World Water Day, EPA chief Andrew Wheeler said safe drinking water, plastic pollution and other litter in the oceans, drought in western states, and water infrastructure are "the largest and most immediate environmental and public health issues affecting the world right now." Wheeler said the Trump administration wants to do more to address water issues that affect up to 2.5 billion people around the world, according to the United Nations, and infrastructure issues that could cost the U.S. up to $700 billion. He said many people will attribute the problems to climate change even though those impacts are decades away. "My frustration with the current dialogue around environmental issues is that water issues often take a backseat. It's time to change that," he said in his remarks at the Wilson Center on Wednesday. "We need to do something about the millions of people who die each year due to a lack of clean water and sanitation. We need to do something about marine debris. And I believe we can do this while still addressing other challenges that loom on the horizon." Wheeler has said human activities contribute to global warming and the impact of climate change, but the administration disagrees with some of the recent reports and studies that emphasize the urgency of reducing the use of fossil fuels. In an interview with ABC News Live last month he said the administration is working on proposals to reduce carbon dioxide emissions but that he doesn't see climate change as a "crisis." "We have one thousand children die every day worldwide because they don't have safe drinking water. That's a, that's a crisis that I think we can solve," Wheeler said in an interview with CBS News on Wednesday, citing United Nations statistics. "Most of the threats from climate change are 50 to 75 years out. What we need to do is make sure that the people who are dying today from lack of having drinking water in third world countries that problem is addressed." But the Green New Deal proposal prompting debate on Capitol Hill is based on a United Nations report that said some serious impacts of climate change could become 'irreversible' in the next 20 years. The timeline has become a call to arms for climate change activists and Democrats who say the country needs to change dramatically to eliminate the use of fossil fuels that contribute to global warming. While Wheeler addressed problems associated with unsafe drinking water around the world, EPA's jurisdiction is mostly domestic. Communities around the country are dealing with aging water infrastructure and contamination from sources like chemicals or lead. 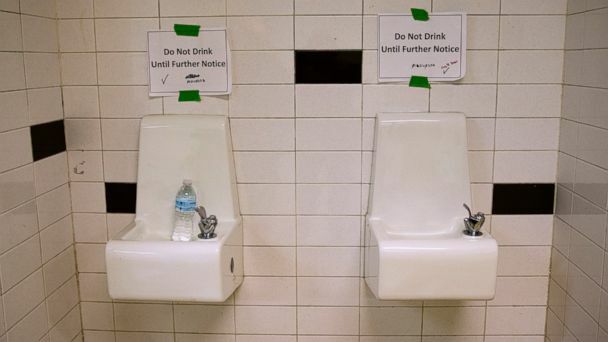 The crisis in Flint, Michigan is one of the most publicized examples but more cities like Baltimore and Newark, NJ have been dealing with lead-contaminated water. Wheeler said the EPA is working with state and local officials in those communities but that in general 92 percent of water systems in the U.S. are safe. Many local officials also say they already experience the impacts of climate change, especially when it comes to flooding, and are already working to make cities more resilient. The EPA's top enforcement issue recently told members of Congress one of the agency's biggest concerns is the number of drinking water systems that are violating safety requirements or using outdated infrastructure.